Trees have captured our imaginations since people first walked amongst them. Possibly even before. There has never been a time when our lives did not depend on the majesty of these great beings, whether for food, shelter, fuel or medicine. As the daughter of a forester I suppose it was inevitable that my chosen path would in some way come full circle and include a special place for trees. I am so grateful for the healing provided by them, there always seems an extra special something in a blend of herbs when it contains some tree medicine! I think trees function as nervines simply by their virtue of being. In my experience, nothing is a greater tonic to the nerves than a walk in nature, wandering through aged boughs and young saplings and feeling your gaze flooded with a thousand shades of green. The nervous system, down to the neurones themselves, bears a striking resemblance to trees, with their myriad branches and roots stretching out and connecting, sending messages and forming an incredible network, the like of which we have barely begun to understand. Having said that, within herbal medicine, not many trees are considered nervines. The blossoms of Hawthorn have been described as such, Peach and Rose make great cooling remedies for the nervous system and then there’s the lovely Linden, one of my favourite trees that is also one of my favourite nervines. Linden, also known as Lime Tree (though no relation to the fruit!) is one of the herbalists greatest allies for soothing stress, tension and nervous excitation. 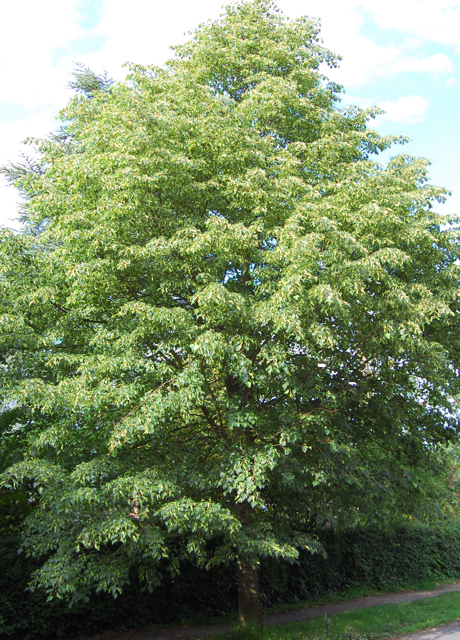 The name comes from an Anglo Saxon root, though ‘Linden’ was originally an adjective, meaning ‘made of Lime wood’. In German, the verb ‘lindern’ means to alleviate, ease or soothe. In various European cultures it has been associated with the divine feminine, being sacred to Freya and Frigga, Goddesses of love, fertility, domesticity and divination. Limes are an ancient species, there is a small leaved lime in Westonbirt Arboretum that is at least 2,000 years old. Limes and elms were once the commonest trees in Britain, flourishing around 6,000 years ago, during the warm Atlantic period. These would have been our native species, Tilia cordata, or small leaved lime, and Tilia platyphyllos, the broad leaved lime. 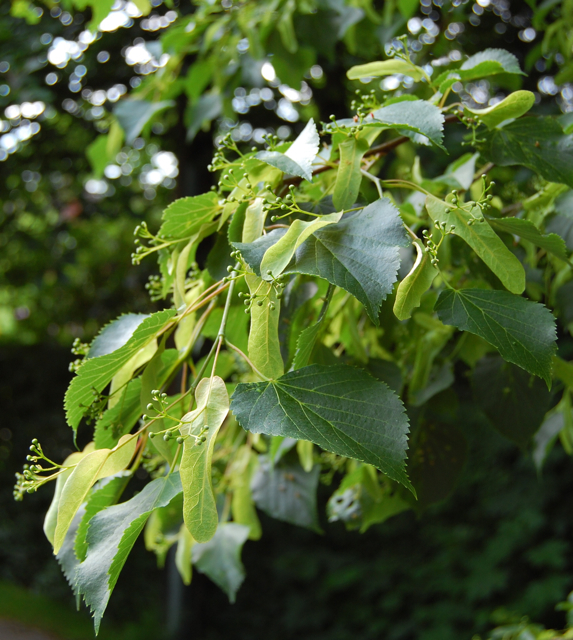 Both of these are now fairly rare, especially the broad leaved, and the lime trees common in parks and lining avenues are the common limes Tilia x europaea or Tilia x vulgaris. A Common Lime - just before flowering. I was hoping the Limes would be in flower by now but everything is a bit late this year. I’m waiting on them blooming any day though! I was planning to share a few more of my recipes but I’ll do an update with some ideas for using the blossoms as soon as they are ready for picking. I’ll be doing some tincture, infused oil, a flower remedy (weather permitting!) and an elixir so do check back in a week or two for some medicine making ideas. Linden is one of the last trees to flower and the blooms are only fresh for about a week so everything has to be dropped as soon as the blossoms open and the bees start buzzing. Bees are the best guides to finding a Linden in flower as they can be heard making merry with the pollen, one of their favourites, from quite some distance. There is an altogether musical quality about this tree and it’s wood was a common choice for making instruments such as guitars and recorders due to its fine acoustics. If the elder is a venerable and wise old grandmother then the linden is a kind and gentle young lady, softly singing her child to sleep. You always feel cared for with a cup of linden tea in your hand. Due to it’s gentle nature and sweet honey like taste, Linden makes a lovely children’s remedy taken as a tea, with a little honey if required. It can soothe irritability in children and adults alike and makes a lovely footbath to aid a restful night’s sleep. In Peter Conway’s interesting book “Tree Medicine’, he writes. 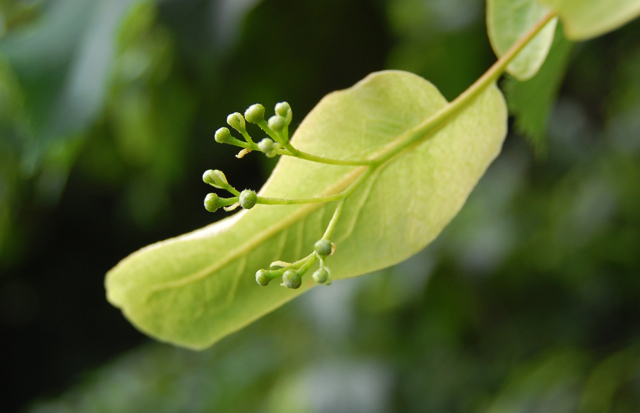 ‘If you are stressed, tense or overworked, you need limeflowers.’ Well thats most of us then! It is highly beneficial to constitutionally nervous types whose anxiety goes to their digestion, a pattern which I can definitely relate to, being what is known in iridology as an ‘anxiety gastric’ type. It’s list of actions include antidepressant, antispasmodic, demulcent, diaphoretic, expectorant, hypotensive, nervine, sedative and stomachic and as such, it’s is good for more then just stress. Linden branch - note the heart shaped leaves. It’s been traditionally used as a heart tonic, helping to reduce cholesterol and high blood pressure, especially if the cause is anxiety driven. It does this in part by relaxing the circulation. If you try clenching your fists hard you’ll notice the skin in your palm going white where the blood has been unable to flow before turning red as the blood rushes back in. Now imagine being in a constant state of anxiety, it creates constriction which results in shallow breathing, reduced circulation and eventually dryness where the blood has been unable to adequately nourish the skin. Linden effectively treats all these conditions, by relaxing the nervous system and the circulation and soothing dryness and inflammation with its high mucilage content. In this way we can see its energy as being expansive in opening up the channels of the body to allow relaxation and flow. It’s also a valuable medicine for the immune system being regularly drunk as a hot tea in France for colds, flus and fevers. As a diaphoretic it helps the body produce sweat which can lower a high temperature and rid the body of infection. Its anti-inflammatory and expectorant properties make it useful in respiratory conditions where it helps remove phlegm, soothe irritated passages and boost the immune system. Interestingly, some describe it as energetically cooling and others as warming and we can see both of these qualities if we consider its ability to stimulate and move (qualities traditionally thought of as warming) as well as it’s use in cooling the body by encouraging sweating and calming anxiety. The bracts and almost opening blossom, both of which are used medicinally. There are also a variety of external uses for lime blossom, as the high mucilage content helps to soothe irritation and inflammation when used an an infusion for compresses or baths or as an infused oil. It is also a valuable herb for beauty as it is high in antioxidants, helps to regenerate the skin and and is thought to help clear acne when used in facial washes. This year I plan to make a nourishing and softening blend of linden and elderflower infused oils to make into face creams. Lovely. Linden shines as a tea, having such a palatable taste that there are few who will dislike it. 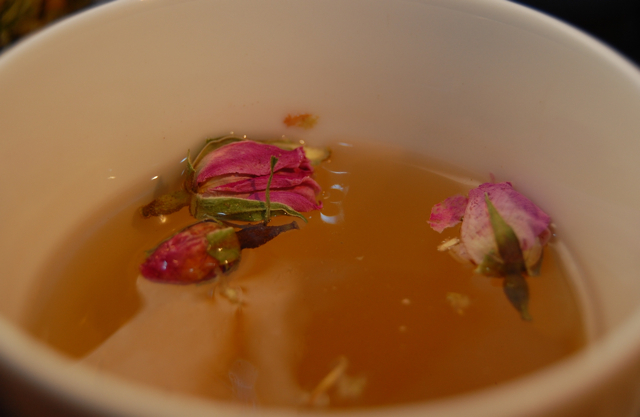 I included my ‘Hug in a Mug’ recipe in my recent post on rose which contains linden blossom, rose and avena, but often I just make a simple linden blossom tea and float a few rose buds on top which gives it a beautiful flavour as well as aesthetic appeal. To enhance the diaphoretic effect it is lovely taken with elderflower at the onset of a cold or flu and can be combined with hawthorn to emphasise it’s ability to lower blood pressure and protect the heart. In very large doses it can cause nausea and may be damaging so stick to 3 or 4 cups a day long term or take larger doses for a short period only. The Linden is truly a gift of healing and wonder. It is strong and ancient yet also elegant and and it teaches us lightness, grace and a subtle kind of merriment. I’m excited for the first blooms which should appear very soon and will be reporting on the harvest and the medicine making as and when it happens. And whispering of stars that fell an age ago. Stillness and lullaby are my gifts to you. But to me you are unique in whichever form you appear today. My song is your medicine. 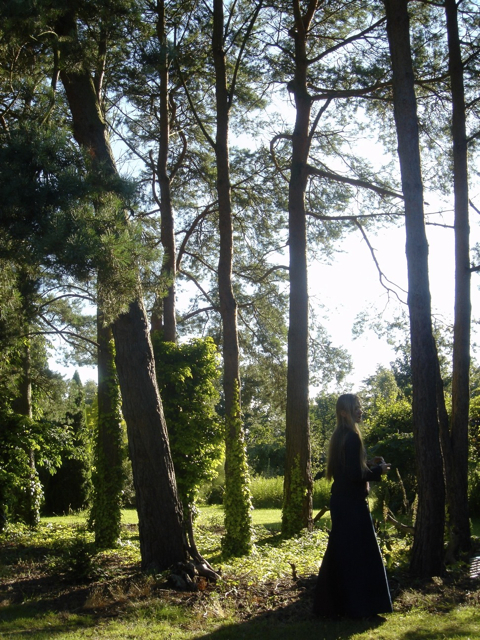 I love the ‘among the pine’ picture… you look like a fairy princess! Thank you for bringing us closer to a wonderful tree. Yes that would be fine. Please credit me as the writer. All the best.